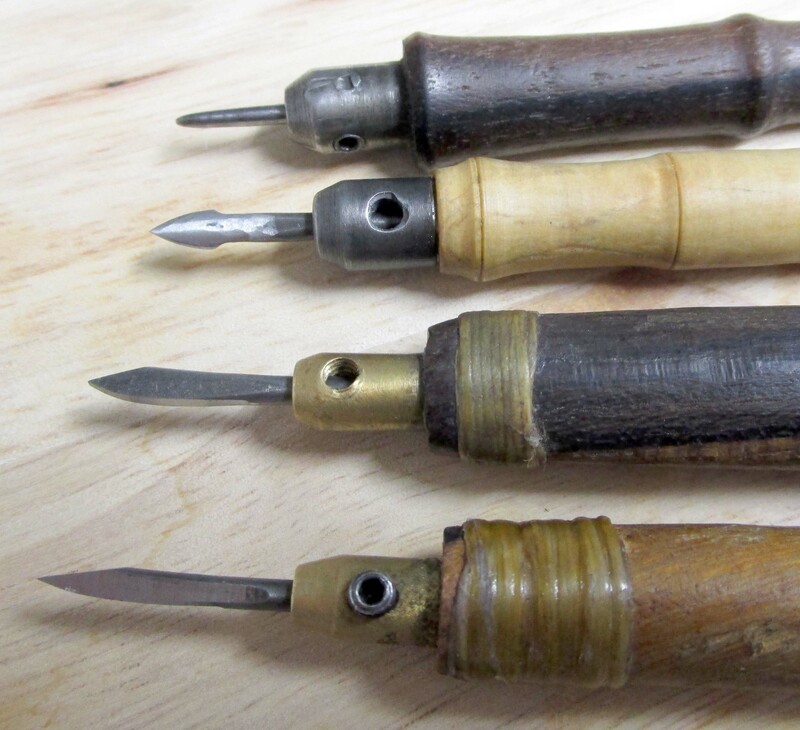 A few years ago, netsuke carver Clive Hallam (clivehallam.com) posted a series of tutorials for making small knives for carving netsuke, which were soon tongue-in-cheek dubbed “Shirley Temple” knives. I noticed they also made great little scrapers for metal, created a couple following his directions, tried them on all the organic stuff I had in the studio, then naturally, tried them out on some of my various metals. They worked like a dream, except that the straight edges and the tiny, really sharp tip was easy to scar the metal with. So, my deviant little mind mulled things over for a while, and then I dug through my engraving stuff to see if I could remedy the situation. So, here are my High Tech Hisage Scrapers. By the way, hisage is an ancient Japanese term for the scrapers used in Japanese decorative metalwork, and are typically much larger than what I’m describing here. Here’s my solution….Not too long ago I purchased Steve Lindsay’s sharpening system for shaping 3/32 inch square gravers. It is a brilliantly engineered, foolproof, and elegantly simple solution to learning the difficult skills of graver sharpening, and easily solved my most difficult problem learning to engrave. Thinking about Clive’s little knives made me think about this sharpening system and how an adaptation of that system might be used to manufacture these handy little scrapers. I cobbled together a few things, starting with a small aluminum block (could just as easily be made from a hard wood or plastic) drilled to fit the scraper blank and drilled and tapped for an allen set screw to fasten the blank in. 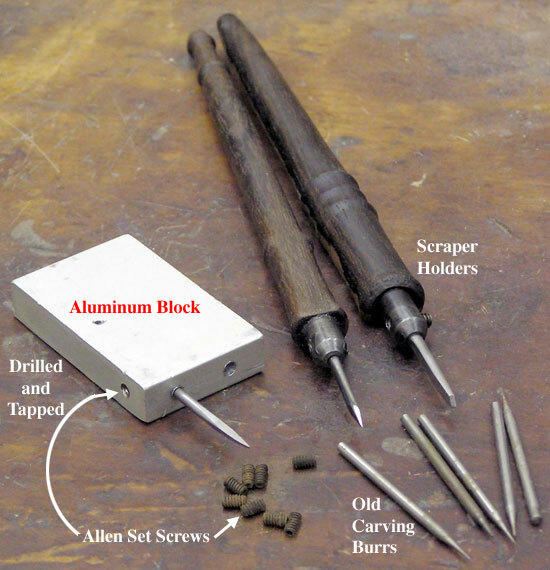 The scraper holders were made from 3/8 inch diameter mild steel rod, drilled through the end with a 3/32 inch diameter drill (to fit the carving burrs) and through-drilled crossways, then tapped for an allen set screw. (I tapped all the way through, so I can use the other side should I ever strip the threads – don’t ask me how I know this will be necessary…). I ground the set screws short so there wasn’t a long allen screw extending beyond the tapped hole (don’t grind the end of the screw with the allen wrench hole!). I epoxied them into wood blanks, then lathe turned the handles, sanding a flat on the bottom side so they won’t roll off the bench – they WILL land on the tips of the scrapers….it’s the law. I start the fixture making process with a piece of aluminum block, lay out a center line and mark for drilling a 3/32 inch and a 1/8 inch hole. Once these two holes are drilled, I’ll drill and tap two perpendicular holes for allen set screws to lock the scraper blanks into place with. Here’s an image of the hand tools and supplies I used. Incidentally, you can also use the high speed steel (HSS) shanks of worn out carbide carving burs for small, single edged scrapers. No heating and hardening needed at all. Here I’ve chucked up my 3/32 inch diameter scraper blank in my Lindsay Template Sharpening system graver holder and I’m grinding the face flat. I made a small square template that I use for reducing the thickness of my graver blanks, and it works well for this purpose as well. If you don’t want to make one yourself, then you can find a handy Lindsay template from your stash that will work. You might need to use a few sheets of paper to shim it up to the proper height. We just need to grind the face flat, so don’t overthink this part – it’s not rocket science. Of course, a GRS dual angle fixture or Hammler Fixture will work as well. This flat face will form the front portion of the two cutting edges we’ll eventually be creating. This should be obvious, but I’ll go ahead and warn you not to get the steel too hot during any of the grinding process, or you will lose the hardness. Should you get the music wire too hot, just reheat to orange heat and quench again. Above is the other part of this little grinding system you’ll need to make, a wooden angle block. This is one I made for my daughter, and looks a little different from the one I use and that you’ll see in some of these images – I hope that isn’t too confusing. It’s just a thick block of wood I squared up, and then cut one side off at a ten degree angle. It’s this ten degree face we’ll use to grind in the cutting edges of our scrapers. Close enough counts here – a few degrees either way probably won’t make any real difference. 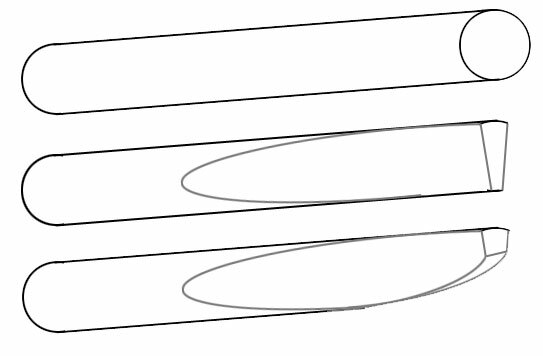 Above is how the angle block works during grinding. I simply hold the wood block in one hand, and the aluminum block with the installed flat-faced scraper in my other hand, and run it against the diamond lap in my power hone. I’ve posed the aluminum block with a little Scotch tape – in use, the aluminum block would be in my right hand, and I’d be holding the wood block with my left hand. I would spin the wood block 180 degrees, hold the wood block in my right hand and the (upside down) aluminum block in my left hand to do the opposite cutting edge. Above is a magnified detail view of the grinding. I move the aluminum block as required to grind whatever shape I want. The intersection of the flat ground scraper face (in the front) and this current grinding will create the cutting edge. As the scraper is shown in the above image, we are creating a cutting edge that will cut to the right on the push stroke for a right handed user. 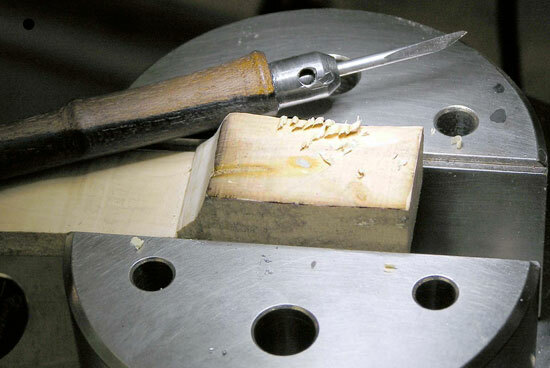 For a double edged scraper like is shown in this image, I’ll reverse the wood angle block, hold it in my other hand, turn the aluminum block upside down and grind the opposite cutting edge (will cut to the left on the pull stroke for a right handed user). Above is the finished double edged scraper, still installed in the aluminum block. So here are the start and finish of the double edged scraper. So, as a review, here’s a quick and dirty graphic describing the basic steps in creating a double edged scraper. And, here’s a simple graphic describing making a single cutting edge scraper. Using a round HSS carbide bur shank, we grind a flat on both sides leaving a taper, and curve the bottom. I’ve exaggerated a little in the diagram, as I grind the tip to about a millimeter in width at the top of the taper. The one shown here cuts to the right on the push stroke for a right handed user. You’ll need to reverse the angles to make one that cuts to the left on the pull stroke. You need BOTH left and right cutting scrapers to get into every nook and cranny on an engraving. Can this be done freehand? Yes, but takes some practice, and I find it difficult to get a scraper to work well each time. I like the repeatability of my method, you do whatever pleases you. When a scraper becomes dull, a few strokes on a fine whetstone will restore the cutting edge for quite a while. However, like any knife, eventually you will need to re-establish the edge as it wears down. 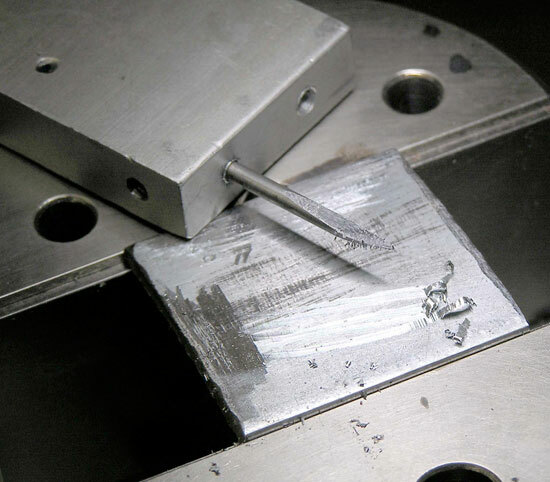 Simply go back to the aluminum block step and do a few seconds of grinding. To use the scraper, I hold the handle in my right hand (like a pencil), and use my left thumb to push the scraper against the material, or as a fulcrum while using the holder as a lever. To use a left cutting version, I hold the handle in my right hand, and pull the scraper with my left index finger – not nearly as handy, of course, but shapes will dictate it on occasion. Here I’m testing the scraper on a piece of mild steel. I haven’t even removed it from the aluminum block to install it in a much more convenient turned holder. This is about 5 seconds of use – notice the nice long curls of steel. Oh, and by the way, it does the same thing in boxwood! Also ivory and antler. I’m pretty stoked – even with making the wood angle fixture and the aluminum block, I have about 90 minutes invested (that does not include the holders). I think I can make a carving bur-scraper from start to finish in about ten minutes, and sharpen it in one minute. Above are the three scrapers I use most (the bottom three), along with my carbide burnisher. The carbide burnisher I’m just tossing in for grins… The bottom scraper is shown from the front side, and is a left cutting scraper (pull stroke for right handers). The second from the bottom is shown from the back, and is a right cutting scraper (push stroke). The third from the bottom is double edged, and you can see the back side here, which I’ve ground rounder and thinner for convenience. It seems to me that a straighter cutting edge is more useful for very curved surfaces. Most of the metalworking I’ve done is on much less curved surfaces, and a plain straight cutting edge seems less useful, and slight curves work better, at least for me. The good news is these scrapers are very easy to make, and virtually cost-free (at least the raw materials), so experimentation is the name of the game! Besides the obvious use for refining shapes on my relief engraved critters, I’ve been using the scrapers a lot to get rid of the excess gold in my inlays. Scrapers with curved cutting edges give me a lot of control removing the gold without scarring up the adjacent surface. I tend to have a lot of tiny gold inlays in my work, and I often produce the undercuts with tiny flats – this leaves a little raised dike of steel around the edges, and the scrapers will easily cut those down as well as removing the gold. A little hint, the non-cutting side of the scrapers can be ground a bit thinner and rounded for convenience. Just don’t make them too thin, or you may get a bit of vibration and excessive chatter marks on your metal. Best of luck with your scrapers! Thanks, Tom. A terrific reference! Hope it’s of use to you!